Microsoft's self-designed Surface will go head-to-head with Apple's iPad. Click here for a closer look at the Surface. LOS ANGELES (CNNMoney) -- Microsoft on Monday unveiled one of the most imaginative and intelligently designed PCs the world has ever seen. Or: Microsoft unveiled yet another iPad copycat, only with fewer apps and a lower screen resolution. Which one is it? It's impossible to know. 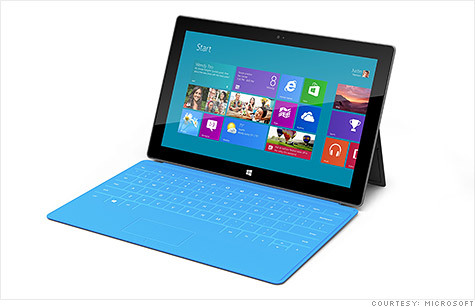 That's because it's not clear yet what Surface, Microsoft's self-designed tablet PC, truly wants to be. Microsoft's team spent years perfecting the top-secret device, paying very close attention to details that only Apple (AAPL, Fortune 500) typically cares about. The tablet weighs just a smidgen less than Apple's iPad and is slightly slimmer, but it feels much more rugged. The Surface's magnesium case is light but incredibly sturdy -- I felt like I could drop it off a table without causing much damage, but I didn't think Microsoft would take kindly to an attempt to find out. The Surface comes with an on-board kickstand, which risks seeming like a gimmicky feature, particularly when Microsoft's engineers proudly demonstrated how it snaps closed to a noise that could be mistaken for a tiny car's door slamming shut. But paired with the tablet's best feature, it actually serves an important purpose. The Surface's 3-millimeter-thick cover doubles as an impossibly thin keyboard and touchpad mouse. With the kickstand in place and the cover lying flat on a table, the Surface becomes the world's thinnest laptop. Microsoft wouldn't let reporters type on the keyboard when it was attached to the tablet with its magnetic connectors -- which are clearly modeled after the iPad's cover -- but it's safe to say the very, very slightly raised keys will take some getting used to. There's almost no way to feel where to place your hands without looking. Yet Microsoft claims that the keyboard's software is sophisticated enough to allow touch typers to rest their fingers on the home keys, and it says the Surface will know the difference between a keystroke and a resting finger. That's not possible when typing on glass, the current standard for mobile device touchscreens. For those who like a keyboard's mechanical feel, Microsoft is also releasing a slightly thicker cover with buttons that can be pressed. Some of the Surface's smaller features illustrate just how much thought Microsoft's team put into its design. The kickstand leans the Surface back 22 degrees, which Microsoft says is the perfect camera angle for video chatting. The screen tapers back a bit at the edges, giving the Surface an elegant look. And the keyboard function shuts off when the cover is folded back. Smart. The crucial question is going to be how Windows RT, the operating system that will run Microsoft's the less expensive ARM-based Surface tablets, stacks up. Those Surfaces are the ones Microsoft that says will be priced competitively with the iPad, which has a entry-level price tag of $499. Those devices won't offer the full Windows experience. They will run on ARM (ARM) chips, the power-sipping microprocessors that are in 95% of the world's smartphones and tablets, which means they will not be compatible with any software that runs on Windows 7 (or earlier) desktops except for Microsoft Office. If your Surface tablet doesn't double as your PC, then you've got a first-generation device that has fewer apps than the iPad, no Siri and no Retina Display. There will eventually be Surface tablets that run the full Windows 8 operating system, which supports all desktop software, but those devices will cost around $1,000. At that point, do you just go for an ultrabook? Or spend a little more for a professional laptop? Surface is a remarkable accomplishment for Microsoft. But a crucial question remains: Is it an iPad competitor or a PC?